If you have read any literature on feeding horses, you have probably come across the idea of “forage first.” Forage for horses is grass. This includes varieties of grass including Timothy, Orchard, Bermuda, and Oat. The concept of feeding forage first is that your horse should be eating at least 1 – 2% of its body weight a day in grass either in the pasture or in the form of hay. Ideally, this should be offered throughout the day so your horse can have small meals and move between mouthfuls. Wild horses have access to lots of plants and grasses in a single day. 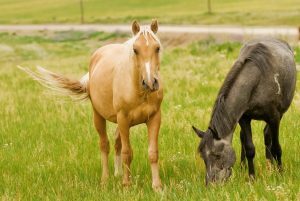 Domestic horses, on the other hand, are usually only served up the basic “meat and potatoes.” We rarely give them variety in their hay or pasture intake, and we usually feed a dense, high-calorie additive in the form of grain. Sometimes we give them the rest of their dietary needs through powders and pelleted minerals. Can you imagine eating just one type of food every day? Or eating only plain salad with protein powder to supplement your other dietary needs? What if all you ever ate was chocolate cake (yum… maybe for the first few days anyway!) or just lived on apples… As you can imagine, you would only be excited about your meals for a day or two before even the tastiest foods would look dull. Not to mention how unbalanced your diet would be to only have one source of sustenance! Horses are very much like us. They love having variety in their meals. I like to offer my horses a selection of foods. This allows them to balance their dietary needs and also makes mealtime more interesting. If I have a horse that is a picky eater, this is often a sign of a major mineral imbalance in their diet. If I adjust his diet, I often see the picky eater become more interested in other food options. A major way to offer your horse variety is to have free choice minerals available in their living area. I always offer salt in both white and trace mineral forms. My horses do well on the blocks designed for cattle, but some horses prefer loose salt. Offer both to your horse for a few weeks and see which he prefers. I also offer a trace mineral feed called izmine, which offers over sixty trace minerals in one supplement. In addition, I offer two ratios of calcium and phosphorus. One is 1:1 and the other is 2:1 calcium to phosphorus. This allows my horses to nibble on either ratio to reach their preferred 1.5:1 ratio depending on the levels they are eating through their forage. Usually offering these four mineral supplements is enough to help my horses to balance their daily forage intake and also allows them to self-adjust for any change in their diets. Horses that are missing nutrients in their diet crave particular minerals or herbs and eat huge amounts of them until they finally reach saturation. Offer the free choice mineral in adequate supply each day to help the horse get what it needs. Then after the horse stops gobbling it down, offer a smaller amount–just in case they still need it. Free choice minerals do need to be kept out of the weather, so put the feeders inside a covered run or other shelters. Many horses love exploring new tastes, textures, and flavors.If you are a fan of treating your horse, why not offer variety in the treating process? If you can offer different hays (even just a bale or two), switch out some of the offerings in the grain bucket. You can also give several different forms of treats to your horse as a reward or a gift. You will see that your horse will be much more interested in what is being served. Using food to enhance your relationship with your horse or horses can be a fun and interesting. Test your imagination. Have you ever tried any of these treats with your horses before: bananas (and peels), oranges, mangoes, watermelon, carrots, apples, oats, alfalfa or grass pellets, flax seed cookies, peaches, pears, radishes, beet tops, carrot tops, peppermint candies, sugar cubes, molasses cookies, etc.? There are many safe and nutritional foods you can try with your horse – just use moderation with treats, and check with your vet if your horse has special dietary needs. Have fun exploring what your horses like!